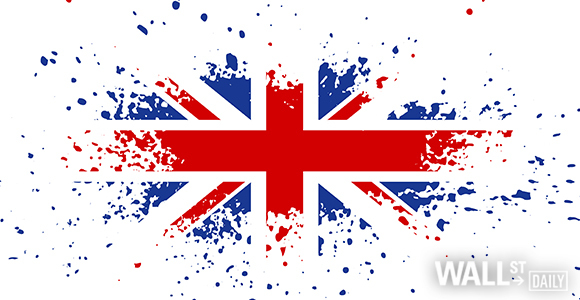 The United Kingdom has the fifth-largest economy in the world. So any geopolitical misstep made by the Brits could sink the entire global economy. I say that because tomorrow’s big event has my stomach in knots. British Prime Minister Theresa May will officially invoke Article 50 of the Lisbon Treaty. Article 50 is (in effect) an escape hatch. It describes how an EU member can voluntarily opt out of the European Union. The document is oddly brief, running a mere 264 words. 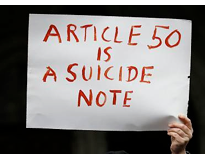 In fact, Article 50 is only marginally longer than an average suicide note (120–160 words). Article 50’s original author is Scottish cross-bench peer Lord Kerr of Kinlochard. Upon writing the escape clause, Kerr believed that Article 50 would be a perfect trigger to launch a coup — he never dreamed it’d be used for Brexit. Article 50’s full text can be found here. I asked my senior analyst, Martin Hutchinson, if I was being unnecessarily nervous about Britain’s withdrawal from the EU. Question: Martin, Britain’s letter to the EU to start the exit process, called an Article 50 notification, is due to be sent tomorrow. What does that mean to London’s financial sector? Martin Hutchinson: It means that in two years’ time, Britain will finally have exited the EU. For London’s financial center, people were worrying that Britain’s exit from the EU would be a problem, but I think it’s actually going to help it. On the downside, Goldman Sachs says it’s starting to implement plans to move people out of London. The EU has already said it won’t let London-based institutions do domestic business in EU countries. But they don’t do very much anyway (Barclays does a bit in France). But all you have to do to get around that problem is to have a few Irish or Luxembourg holding companies, which then own the domestic business within the EU. So that’s not very difficult to do. The advantage to Britain of exiting is that international finance requires light regulation. Regulators can’t keep up with new products. Businesses operate in several countries with different regulatory systems, and then get several bureaucracies involved and they quickly overwhelm a fast-moving business. So the international finance business will always flow to the lightest-regulation place — with good people, infrastructure and that’s not controlled by the mafia. That’s why London had the lightest 19th-century regulation of finance. It’s why it became a global capital. Question: But Hutch, bankers are notorious for finding ways to, quite honestly, steal. Won’t they just do it again? Martin Hutchinson: The flaw in 2008 was the domestic U.S. housing finance market. It wasn’t an international problem at all. So I don’t think international finance is any more liable to stealing than domestic or regular finance. But it needs the light regulation in order to operate. The EU has been a hindrance to London since the 1990s. EU staff like regulations, and a lot of them want to stick it to the Brits. Like the U.S. regulators, they invent reasons to fine banks. So you’ve got the LIBOR scandal and the foreign exchange scandals, which were used to extract billions of dollars from banks. It’s a nice money-earner from the regulators, but it does nothing for the financial business. And then you had constant disputes between Britain and its EU partners on regulation. It’s been a major cause of friction between Britain and the EU for the last 20 years. So Britain without the EU will be able to grab business from the U.S. that is overregulated — Trump may change that a bit, but I bet he doesn’t change it completely — and from Hong Kong, which is, frankly, a bit untrustworthy, because it’s owned by China. Britain will be able to increase its share of the global financial business and should do pretty well after leaving the EU. Question: Given that, Hutch, does that spell opportunity for investors? Martin Hutchinson: Yes, I think it does. If you want a British bank, I think you want the most international of them. In other words, not someone like Lloyd’s that’s primarily domestic. You want the one that’s going to take the most advantage of the opening up of the global market, and that’s HSBC Holdings (HSBC). It started off as the Hongkong and Shanghai Bank. It’s the most international British bank and will gain most from London becoming a truly global financial center. It’s selling at the moment on one times book value (just at the book) and on 11.7 times forward earnings, which is quite cheap. And it yields a very nice 4.9%. Overall, I think, HSBC is a pretty good play to take advantage of the London financial market’s benefits. Question: Hutch, the day is here. Britain is leaving the EU, and there’s nothing anybody can do about it at this point, right? Martin Hutchinson: That’s probably right. Yes. The post Brexit Update: Pulling the Trigger on Article 50 appeared first on Wall Street Daily.